Falls Lake will host the Elimination and Knockout rounds during this week's MLF Bass Pro Tour event. Now things get a little tricky for the 80 competitors on the Major League Fishing Bass Pro Tour. 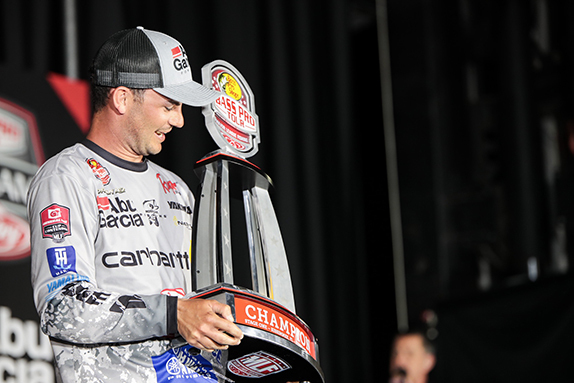 Florida's Kissimmee Chain of Lakes, site of the season opener, is a venue that's familiar to every veteran tour-level angler in the country. Texas' Lake Conroe, where the second event played out, is less of a traditional stop for large-field pro derbies due to its smallish size, but it hosted a Bassmaster Classic just two years ago and is a nationally famous fishery that's not shrouded in any mystery. This week, the BPT visits Raleigh, N.C. to open the second quarter of its inaugural campaign (the tournament gets under way Tuesday and runs through Saturday). Three distinctly different lakes � Jordan, Falls and Shearon Harris � will comprise the playing field. Covering approximately 30,000 acres combined, none are well-known to bass-chasers outside the region and almost all of the BPT competitors are experiencing them for the first time. The field got one day of practice on Jordan, which will be the site of the Shotgun Round, and one on Falls, where the Elimination and Knockout Rounds will be staged. From there, the 10 surviving anglers will go to Shearon Harris, where they'll be forced to figure things out on the fly. The three bodies of water are in no way connected. Jordan and Shearon Harris both sit south of Raleigh and are about 10 miles apart. Falls lies to the north of the city and is a good 45-minute drive from the other two. All fish caught and scored will be largemouths, as none of the three lakes contain smallmouth or spotted bass. Joel Munday, who operates Outdoor Expeditions USA and guides on all three lakes, provided BassFan with a bit of information on each of them, starting with the Shotgun Round venue. At 14,000 acres Jordan is the largest of the three lakes. "Jordan is interesting because it's just now getting back to normal," he said. "There was some pretty severe flooding over the past several weeks and the ramps were closed for a while and it was really unfishable. It got to 229 (feet above sea level) and it's normally at 216. "It's setting up pretty good for those guys because it hasn't been pounded to death � there just hasn't been a lot of (recent) pressure. It's where I'm expecting the jaw-dropping weights to come from." He expects most of the fish to be in the pre-spawn mode. Most competitors will target rock piles witch crankbaits, spinnerbaits and jigs. He hasn't been on Falls (12,400 acres) for about a month and a half, but said its water level also recently returned to normal. Two weekends ago, a local team tournament was won with a 28-pound stringer and another team made a run at that mark with just four fish. 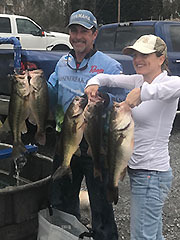 Shane Burns and Bonnie Kelly caught 40-plus-pound stringers from Lake Shearon Harris on back-to-back weekends in March 2017. "With normal conditions, it should be a crankbait-spinnerbait-jig-type bite there as well. The north end is shallower and there's more spawning flats up that way. There's a really defined channel that runs through a good portion of it and a lot of it is stumpy � there's some good areas to get around fish that are pulling up to spawn." Shearon Harris gained a bit of widespread acclaim two years ago when the team of Shane Burns and fiance� Bonnie Kelly won local tournaments on consecutive weekends with stringers weighing 42.90 and 46.89. Fishing a single staging location, they culled an 8-pounder and seven others over 7 en route to the larger haul. "The fish are starting to pull up there and I'm seeing it change every day," Munday said. "Most guys will probably be fishing in and around the primrose grass on that lake. Some folks could use their electronics to find some fish offshore, but I think you'll see the winning weight come out of shallow water." 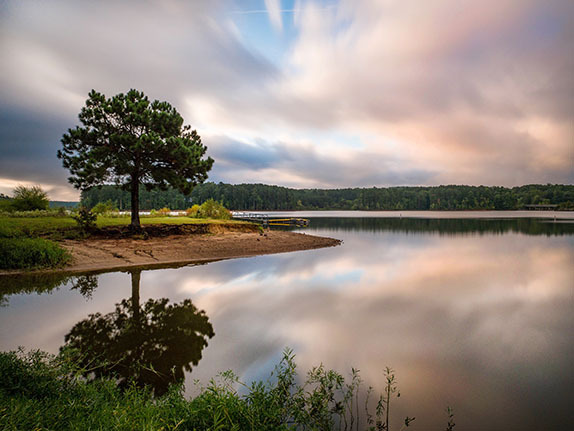 The lake is the source and outlet of cooling water for the Shearon Harris nuclear power plant and rumors about a warm-water discharge abound, but he said there's no such phenomenon. "There's some bad information out there about that." Here are a few other observations from Munday regarding the event. > "I don't think there will be a lot of sight-fishing � it's a little early for that and the water isn't the right color. There definitely won't be any on Jordan or Falls; if there's any at all, it'll be on Harris." > "I don't see anybody clobbering big numbers, like 30 or 40 fish in a day. I do see a lot of big fish being caught, though." > "Some guys might find fish both shallow and offshore, but I'd be surprised if most of what they're doing isn't in 10 to 12 feet of water or less. Probably much less than that." > "Shearon Harris has gotten a lot more pressure over the last couple years since those 40-pound sacks. I've seen license plates from all over at the ramps." "Practice was a grind for me both days. I got a fair amount of bites and I'll gladly take the bites I got, but it's been kind of frustrating because it seems like we've been a little too early everywhere we've gone. We've had decent events, but it would've been nice to have another week or two for the weather to cooperate. That's fishing, though, and whether it's tough or not, somebody's still going to win. "I think I've found enough to lead me in the right direction and I'll try to go out there and let it happen. The bad part is I'm in Group B (which doesn't fish until Wednesday) and the other guys are going to get out there and beat everything up first. The good part of that is it'll be the other way around when we go to Chickamauga." "These lakes have definitely got some good ones, but there's just not tons of numbers and I think that's purely based off the kind of weird conditions. You can tell where the high-water mark (from the recent flooding) is and on Jordan it's like three feet above your head. It has the feel to it that it's come down really fast and I don't think the fish have adjusted. Jordan Lee has done extremely well in BPT event so far and now gets a chance to fish a lake that shares one of his names. "My least favorite thing is to have falling water like that, but have warming trends in the spring. The fish don't really know what to do and they just kind of shut down. That's why we're not seeing a lot of bites. "On one of the lakes I was able to develop somewhat of a pattern that wasn't completely random. I'm glad we're on two instead of one because the other one wasn't great." "There haven't been a lot of bites for me. I've seen some nice fish, but there aren't many of them to go around. I've been to both lakes and, in my opinion, we need to take about a foot of water out of Jordan and put it in Falls. Jordan has a little too much and Falls is just so flat that I don't think the big ones are really going to get up there (shallow) until they get a little more water. "You can tell the quality of fish is good � when you do get a bite, even the smaller ones are fat and squatty. They remind me of the fish in Grand Lake. It's just not easy to get a bite." "I don't want to say these aren't great fisheries because I don't have any history here, but I think with the water color and all the high water and the mud they're just a little out of whack. The water is extremely dirty and that's playing havoc with fish not being where they should be to be catchable. "Some big ones have been caught this week, so there's no denying they live here. I haven't talked to anybody who's said they haven't caught a big one or two. It's a matter of getting fortunate and getting a few of those bigger bites. "Looking at past tournaments it might seem like there's not very many small fish caught, but I've caught some dinks, too. A person's just going to have to cover a lot of water and keep their head down and grind." "I got three bass bites on Falls (Sunday) and four on Jordan (Monday). I don't think guys are getting a lot of bites. These are tough, pressured fisheries. There should be quite a few big bites, but probably not a lot of numbers. "I think Falls might be a little better overall, numbers-wise. Jordan seems like it's still high. Falls went up and back down pretty quick and it seems like the fish are more adjusted to the water level than they are on Jordan. "With this new format and going to different lakes, you time in practice is shorter and with the change in weather (a cold front was set to arrive just prior to the first day of competition), come tournament day people might be fishing places they haven't looked at." "There will be some good ones caught on Jordan, for sure. I practiced there (Sunday) and caught one 4-pounder and shook off two or three more that felt bigger than that one. I don't think you'll see anybody catch a lot of fish, but maybe somebody's got them figured out. "Jordan's nothing by bushes and trees and stuff in the water. It's super-flooded and it really looks fishy. You go over to Falls and there's nothing but a lot of rocks and it doesn't seem like too many are living on the rocks. I went until 11:30 (Monday) without a bite and I couldn't figure out what was going on. I checked all kinds of stuff and there was just nobody home. The bite seemed better as the day went on, so maybe guys will catch them in the afternoon." Based on the current conditions, here are a few anglers who might fare well in this event. 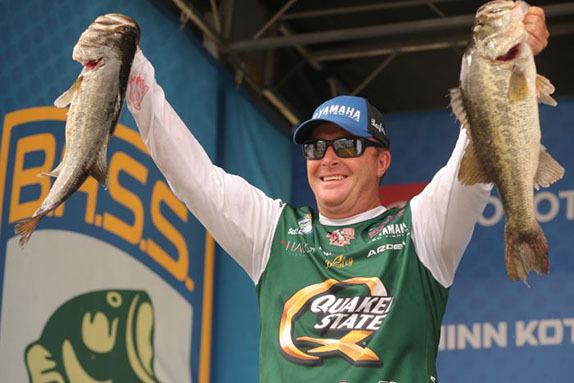 > Kevin VanDam � Crankbaits and spinnerbaits should be effective. Seems like we've heard of him doing okay with those once or twice in the past. 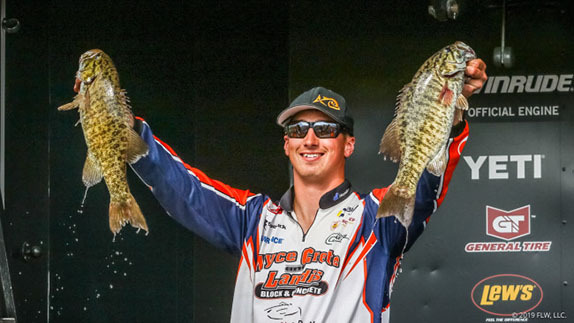 > Jordan Lee � He's finishes 1st and 6th in the two BPT events thus far and he'll fish one day on a lake that shares one of his names. Gotta go with him. > Aaron Martens � He's itching to shake the hangover from his miserable Bassmaster Classic showing. He excels at figuring things out quickly, which should be what this derby is all about. 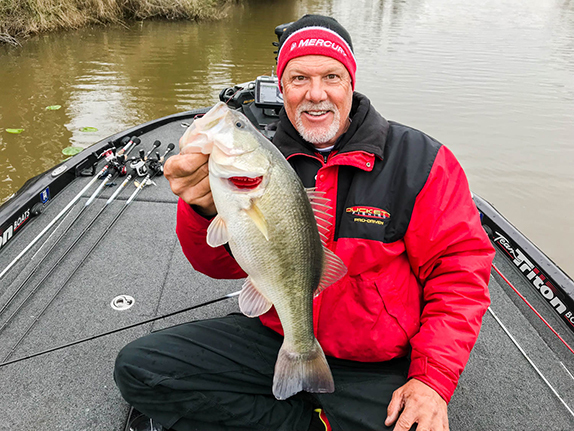 > Randy Howell � The North Carolina native is one of the few anglers in the field who've previously been on these bodies of water. That long-ago experience likely won't be significant this week, but perhaps the nostalgic vibes will give him a boost. The field will launch at 7 a.m. daily from the Farrington Point Boat Ramp in Chapel Hill, N.C. (days 1-2 on Jordan), Upper Barton's Creek in Wake Forest, N.C. (days 3-5 on Falls) and Holleman's Crossing in New Hill, N.C. (day 6 on Shearon Harris). The post-game show will begin at 5 p.m. each day at the Bass Pro Shops in Cary, N.C. (801 Bass Pro Lane).